Covering 843 acres in the middle of New York City, Central Park offers a tranquil oasis from the bustle of the Big Apple. It’s gorgeous landscaped gardens, meandering pathways and ornate architecture are as iconic as the Statue of Liberty, and for couples who hold this city near to their hearts, there is no better place to say “I do” than backed by the lush greenery and towering skyscrapers for which Central Park is renowned. While there are countless romantic locations within Central Park to hold your wedding ceremony, the Conservatory Garden is perhaps the most popular. This six acre formal garden draws on Italian, French and English influences, accessed through the impressive 19th century iron Vanderbilt Gate. The Italianate lawn is bordered by pink and white crabapple trees, while a 12-foot high fountain bubbles along the western edge. To the north, the French-style garden showcases tulips, chrysanthemums and Japanese holly, while the famous Three Dancing Maidens fountain stands as its centerpiece. The English-inspired garden lies to the south, with seasonal flower beds and woodland plants, as well as a memorial fountain which pays tribute to the children’s book, “The Secret Garden”. Permits are required to hold your wedding ceremony in Central Park, with strict regulations that prohibit any amplified music, personal furnishings or decor, as well as alcohol consumption. You need to reserve your date and time in advance and keep in mind that only intimate wedding parties of 25 or less are permitted. 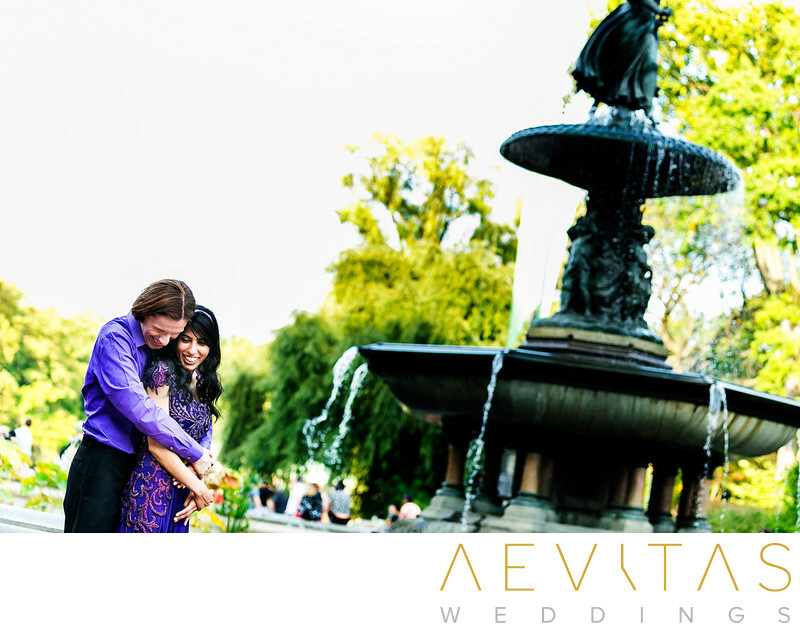 Wedding photography requires an additional permit but allows you to take advantage of the gorgeous natural settings and rustic architectural features throughout Central Park. Take the time to explore its leafy walkways and fountains, all backed by the famed cityscape of New York City. Although wedding receptions are not allowed in Central Park NYC, there are plenty of nearby venues in Manhattan where you can hold a lavish party following your nuptials.